Perfect for vacations business trips traveling etc. Traveling overseas? Make sure your phone charger and other small electronic devices get the power they need. 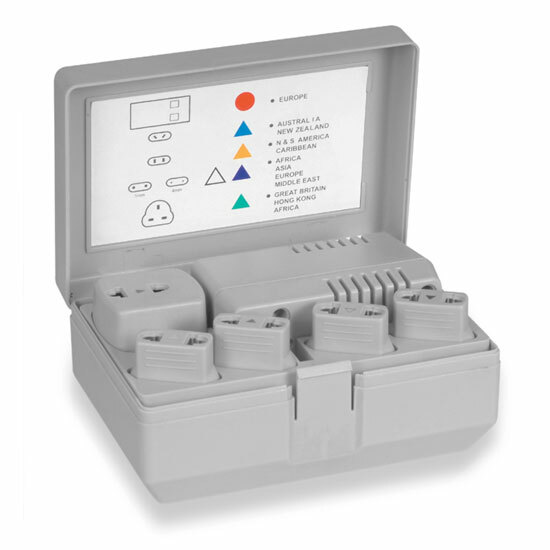 The PVKT130 Includes dual-watt converter with six separate adapter plugs. Includes low and high Watt setting switch too change between a wide variety of electronics and appliances. Important: For small appliances and chargers only. Always check your appliance's wattage requirement and your destination's voltage standard to ensure compatibility and not to over exceed power regulations. Caution: Not for use with computers, stereos, TVs, DVD players and other high-powered electronics. What type of fuse is specifically used for this unit and do you carry it? we do not carry the fuse, please take the old fuse and match it at your local Electric store.